Friday, April 14th from 3 – 4.30 p.m. Open to all and Free of charge! Not everyone has the opportunity to take a week off to attend one of our summer courses. With this in mind, we would also like to invite you to come along to our meetup. The theme is creativity and networking, so you can come and talk shop without having to take a day off. We will also be holding two workshops, Fashion Design and Fashion Styling. There will also be a drink and a snack waiting for you. It would be great to see you there. Entrance is free, but please come on time! We look forward to seeing you on Friday, April 14th from 3 – 4.30 p.m.
Free your talent and develop your creative potential! Want to enjoy the vibrant summer life in Amsterdam and immerse yourself in creativity? Then look no further than our summer programme. 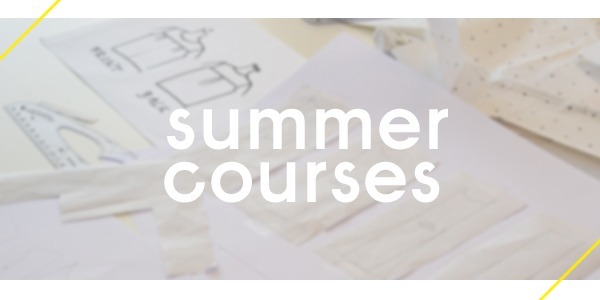 The beauty of our summer programme is that you can choose what suits you best; you can opt for a one week course but you can also choose to join us at the academy for two, three or even four weeks. The courses have been designed to fit together perfectly. If you would like more of an idea what to expect then have a look at the following programmes: Fashion Design, Fashion Styling, Creative Pattern Cutting and Portfolio Development.